The "Song of the Thirteen Postures" is one of the Taijiquan (Tai Chi) Classics. The term "Thirteen Postures" usually refers to the classic fundamental movements of taijiquan. However in this anonymously written essay the focus is more on the basic theoretical principles of mobilizing the qi (vital life energy) through the interplay of mind, qi and body. The following entry including its annotations has been adapted by the editor, John Voigt, from various translations and commentaries listed in Sources below. 1-a. The Thirteen Postures should not be neglected. The reader is being admonished not to disregard this serious and profound martial art and to actually practice it. [editor's comment]. 1-b. Their source is in the region of the waist (yao). "The waist is the mainstay of all the T'ai Chi movements...The four limbs rely on it to revolve and the whole body depends upon it for support." [T. T. Liang 46]. 2-a/b. When alternating back and forth from emptiness [yin] and solidness [yang] be mindful and mentally focused (yi), taking care that the qi is flowing freely, without any sluggishness, throughout the body. 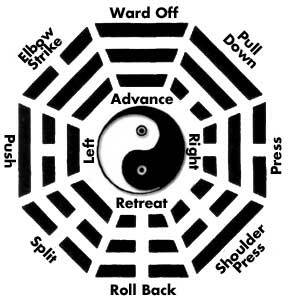 A basic method to understand and successfully practice taijiquan is to continuously alternate back and forth from yin (empty -"insubstantial") and yang (solid -"substantial.") As an example, if attacked on the left side, withdraw your body and shift your weight to the rear foot, now further neutralize the attack by turning to the left. The left is now insubstantial [yin]; you counterattack with your right hand which becomes substantial [yang]. [Liang 43]. Qi here functions as the fuel that grants the body and mind their power, clarity, and force. Top: English. Bottom: Pinyin. The Thirteeen Postures (8 Gates and 5 Steps) are referred to in various ways by Taijiquan authors. Some call them the Thirteen Powers, others call them the Thirteen Postures, the Thirteen Entrances, the Thirteen Movements, or the Thirteen Energies. They are often associated with the eight basic trigrams from the YiJing (I-Ching) and the 5 elementary processes (Wuxing). 3-a. In stillness action stirs; in action there is stillness. "When applying Tai Chi Chuan in combat, you must be calm yet alert: your form is still, but your chi (qi) is moving inside you. When you move, your movement is very swift, but your mind is still." [Wong Kiew Kit 31]. 3-b. [In this manner you are] Adapting to the opponent's moves and conditions will seem mysterious and full of wonder. 4-a. Deliberately consider the intention and purpose of each movement. 4-b. Then it will be possible to obtain effortless skill (gongfu). 5-a. Always keep the mind (xin) centered at the waist (yao). 5-b. With the abdomen calmly relaxed, the qi [stored there] can rise (the Chinese word for rise, "teng" also can mean: to soar, gallop, prance, or move out) without hindrance. 6-a. Keep the tailbone (coccyx) centrally aligned and straight so the spirit of vitality (shen) penetrates up to the crown of the head. 6-b. Then, with the head feeling as if suspended from above, the entire body will be light and agile. 7-a. Carefully and attentively study the techniques deep into their roots. 7-b. Then bending-stretching, opening-closing, will be done with a freely spontaneous skill. 8-a. When beginning the training a teacher is required to lead the way. 8-b. Accomplishment comes through one's unceasing labor and personalized study. "This stanza is the most detailed statement in the whole of the [Taijiquan] Classics about the act of studying. It speaks of the beginning of study, the relationship to the teacher, and the discipline of taijiquan itself. Achievement, however, cannot happen without your own hard work. Paradoxically, you cannot think about it too much, or you will not have the necessary spontaneity and naturalness. Theory and practice cannot be divorced from one another. You need both the feedback and experience that a teacher offers. However, the teacher cannot do the work for you; you must apply yourself diligently, over a long period of time." [Barbara Davis 147]. 9-a. When speaking of form and method of application [of taijiquan movements] what should rule as the standard? 9-b. The mind (yi) joined with qi (vital life energy) rule; the body (flesh, blood and bones) serve. "When looking at the correctness of movement the criteria is, are the mind and Chi [Qi] directing the movement. All the movements are done with Jin [energetic power] supported by the Chi and directed by the Yi (mind). If the movements [only] are done with the bones and muscles, this is your Li (strength) [brute muscular force] and is considered incorrect." [Dennis Watts]. 10-a. What is the final purpose [of the practice]? 10-b. To extend life, bestowing [upon the practitioner] an ageless joyful springtime of youth. 11-a. A song to sing; ah! a song to sing. 11-b. One hundred forty word/characters [given above], each word is true and clear; its meaning is complete. 12-a/b. If one does not carefully study these words and practice their meaning, then in vain they have wasted their efforts (gongfu). Theirs will be sighs and gasps of regret. Yao - 腰. Simply translated as "waist" but can also refer to the lower torso, or the pelvic region including hips, loins, and lower spine. Also the body's center of gravity, and the dantian ". Xin - 心 (sounds like "shin(g)"). Heart and mind: the merging of emotion, desire, goals, wishes, attitude and aspirations. Gongfu - 功夫. (kung fu) Skill; art; labor; effort. Editor's comments on the translation: The original text is problematical. For example, its title and opening words are literally "Thirteen Postures" which could be referring to the thirteen basic classic movements of taijiquan; or instead be referring to the earlier name of taijiquan itself—or to both! Not only that, the word "postures" [shi in the original] is misleading because the idea is not static "postures" or "positions" but rather fluid taijiquan "movements." Admittedly "Thirteen" does mean thirteen, but what exactly these moves (or positions) are, and exactly how are they to be executed, is hotly debated within the taijiquan community; along with most teachers suggesting fewer or more than thirteen basic movements. And it becomes even more confusing because the anonymous author of the text wasn't that concerned about martial arts outer postures or movements, but rather concerned with using the inter-connected internal aspects of the mind-body-breath energy nexus to gain a long and healthy life. And added to all this confusion is the last word of the title "ge"–literally meaning "song"–is not really accurate because the text is written as a poem, and not as a "song." Even in the original, the Chinese is cryptic to the point of a confusing ambiguity. The text seems like quickly jotted down notes—brief aphorisms for a reader who already is well versed with the material. Something like a Cliffs Notes study guide monograph for college professors to refer to when teaching a class. It is impossible to render a translation into English that grants a full transference of all the meanings of the original. (Even in Chinese many of the phrases are open to various interpretations.) It is inevitable that any translator will interpret the original text through the filters of his or her own way of thinking, and create a personalized document. In my goal of producing a clear, honest and easy to understand version of the text, I used eleven different translations all listed in the Sources—some such as T.T. Liang's and Barbara Davis's, had outstanding commentaries from which I borrowed and cited. I also used various internet translating sites, such as chinese.yabla.com which offered various possibilities for each word. I must now confess, as the editor of Qi Encyclopedia, my own bias: which is an intellectual and experiential exploration of Qi—(a word that probably is impossible to perfectly define in any language). I tried, therefore, to emphasize Qi's presence and function in the "Thirteen Postures Song." ^ "Song" as used in the title is actually a poem used to facilitate memorization. To maintain the rhyme it was made up twelve pairs of seven character sentences; this is reflected here by the numbering added by the editor. "Postures" here is about the inner-movements of qi within the body related to the outer-movements of the four limbs, more than any concern with just static positions. The title in Traditional Chinese is 十三勢歌. In Simplified Chinese it is 十三势歌. In pinyin it is Shisan shi ge, literally meaning the "Thirteen Postures Song." Paul Brennan. Song Six (Known as the Thirteen Dynamics Song). Cheng Man-Ch'ing, and Robert Smith. "Song of the Thirteen Postures," pp. 111-112 in T'ai Chi: The "Supreme Ultimate" for Health, Sport, and Self-Defense. Tuttle, 1967. Louis Swaim and Fu Zhongwen. Mastering Yang Style Taijiquan. Blue Snake Books, 2006. Wong Kiew Kit. The Complete Book of Tai Chi Chuan. Tuttle, 2002.